The Challenger League, formed by adults of the Don Guanella and Divine Providence (DGDP) communities, played its season-ender on May 30 at Cardinal O’Hara High School. Through DGDP, the league’s players — all of whom are adults with intellectual and developmental disabilities — receive a broad range of support from archdiocesan Catholic Social Services (CSS). Students from O’Hara’s Community Service Corps (CSC) assisted the DGDP players as they squared off in a game of wiffle ball against the boys’ varsity baseball team from Bonner and Prendergast Catholic High School. Jim Gula, the coordinator of the Challenger League, said the DGDP team members study the game closely. The Challenger outreach pairs the DGDP participants with volunteers who accompany players throughout each match, escorting them to each base and back to home plate as needed. Sideline banter, rowdy cheers, food and fellowship round out the games. For the high school students, the weekly games have opened up horizons that stretch far beyond the baseball diamond. The CSC members devote approximately three hours of their time per week to play wiffle ball with the DGDP team. Students eagerly embrace the commitment, which is separate from any required community service. “I just love to see the DGDP players, to interact with them,” said Gavin Lewis, a freshman at O’Hara and one of the CSC leaders. 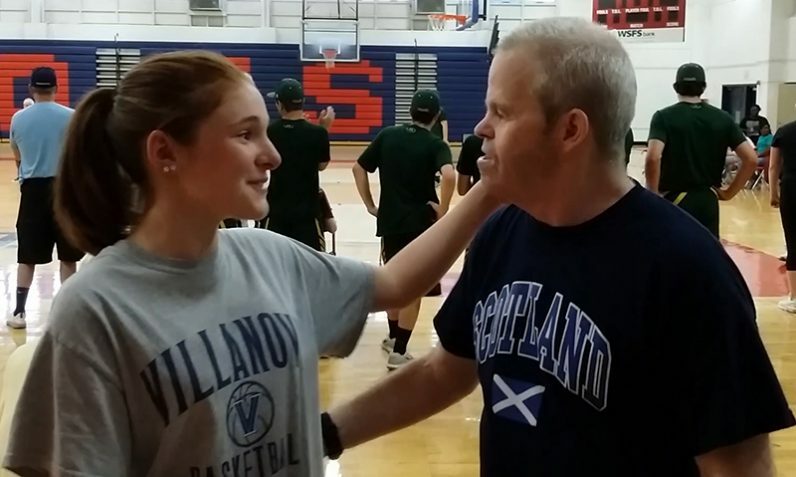 Amanda Shaughnessy, a fellow O’Hara freshman, was drawn to work with the DGDP team for family reasons. Family ties also prompted Gula to pitch in. “This started off as my daughter’s service project for confirmation,” he said. While organizing the confirmation project, Gula reached out to a longtime classmate — Father Dennis Weber, S.C., the director of ministry and mission at DGDP. Both had attended Monsignor Bonner High School, where Gula was a baseball hall-of-famer. “I went up to him at a high school reunion, and I said, ‘Hey, I want to be a coach. Can you get me a job?’” Gula recalled. Father Weber appointed Gula as a volunteer coach at what was then Don Guanella Village, which eventually merged with the Divine Providence Village for girls and young women. Nearly three decades later, Gula estimates that “hundreds of friends and colleagues” have volunteered with the project, which was inspired by the Little League Challenger Division, the adaptive baseball program founded in 1989 for individuals with physical and intellectual challenges. Both Gula and Wieners note that the student volunteers have been profoundly transformed by their interactions with the DGDP community. Above all, the student volunteers keep the focus on the fun.